The Howard Chistensen Nature Center. I’ve been holding off doing this one, as the nature center closed due to “a lack of funding”, but it sounds more to me like government mismanagement. I try not to get too political on my blog, but the story of this nature center is the sad story of a quagmire of government agencies not knowing what they are doing, and how people get themselves appointed to boards that over see things like this nature center just for the prestige and maybe a few bucks extra from serving on a board. The land was donated to Kent Intermediate School District by the late Frank and Rita Christensen in memory of their 17-year-old son, Howard, who died in 1961 from a brain tumor. It was set up to be a place where school children could go on field trips from school to learn about nature. Despite receiving a lot of use and many accolades, the KISD shut the nature center down for the first time back in 2005, claiming a lack of funding, which wasn’t true. The KISD is known for sitting on huge sums of cash, the state has even stepped in and ordered the KISD to spend the money on purposes it was raised for. Unfortunately, the Howard Christensen Nature Center wasn’t one of the uses the state has ordered the KISD to spend money on. Instead, the Kent Conservation District, which is more or less an extension of the US Department of Agriculture, took out a lease on the nature center in order to re-open it. “We didn’t know there was a problem (when our board last met),” said Northup, a professor of natural resources management at Grand Valley State University. “It was quite a shock to me. So I guess no one on the advisory board bothered to do anything other than have their name listed as being on the board, and that’s a shame. It’s sad that the legacy of the Chrsitensen’s means so little to the people in charge of the nature center. It is sad because up to 11,000 school kids a year visited the nature center, most of them inner city kids who had no other exposure to the great out doors other than their field trips to the nature center. Despite the nature center being closed, the trails are still open for the public to use. The nature center itself is small, only 135 acres, and the trails are not that long. But, it is also a stepping off point to the Rogue River State Game Area, and the North Country Trail which follows the Rogue River on the other side of Red Pine Drive, where the nature center is located. The nature center itself has pleasant trails, well-marked, that go through fields, woods, wetlands, and follows one of the small streams that feeds the Rogue River for a way. When I go there, I normally walk the trail that heads for Spring Creek, then cross the creek out of the nature center, and into the Rogue River State Game Area. There are some trails, but they aren’t mapped or marked, and I do a lot of bushwhacking when I go there, that is, just wander around using my GPS unit to guide me. It is a beautiful area, with a couple of small lakes and streams, and many wildflowers in the spring. If you don’t need marked trails to get around, it is a great place to go. If you do want to follow a marked trail, the North Country Trail can be accessed from the Howard Christensen Nature Center as well. That section of the rail is very nice, although part of it runs right along Red Pine Drive. Here is a map that shows the area, and you can see there is a lot of public land and many options for a day hike in the area. 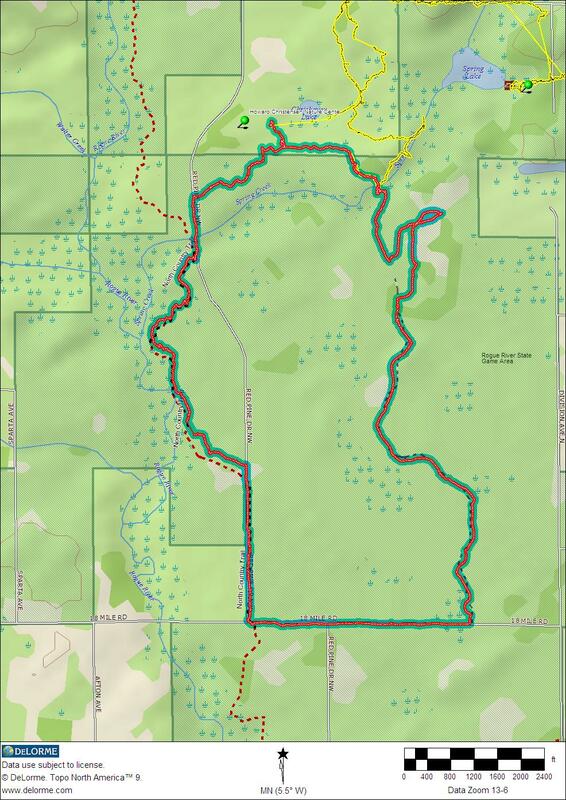 This map shows two possibilities, the yellow track is from one of the first times I went to the HCNC, I walked most of the trails in the nature center, then walked along 20 Mile Road to get across the wetlands that surround Spring Creek, to get to Spring Lake and back to the nature center. That was 4 miles more or less, and some of it is cut off on this map, sorry. The solid red line shows where I walked the HCNC, then crossed Spring Creek to hook up with an un-named trail that goes to 18 Mile Road. I cut over on 18 Mile Road to pick up the North Country Trail, which is the set of red dashes on the map, and again, I cut over on 18 Mile to avoid a large marshy area that doesn’t show up on this map. This loop was 6 miles, and the section of the North Country Trail I walked meets up with the Rogue River, it is a particularly nice section of the trail. It is a very nice area, lots of forests of varying types and ages, and lots of small creeks and wetlands in the area as well. There are some larger swamps and marshes, especially along Spring Creek, and when you get near some parts of the Rogue River, large enough that you have to plan your route around them. If you do go there, I would suggest starting off with shorter walks on the marked trails until you get a feel for the area, before you start going cross-country, as I do most of the time now. Thank you very much for the updated information, I have heard nothing about this new financial crisis. Thank you for setting the record straight! I’ll have to check out the link you provided, along with visiting the center a few times this spring.